To most people, this is the 'classic' era of the Roman army, when legionaries equipped with the famous lorica segmentata used javelin and short sword to subdue the barbarians and bring the Pax Romana to the known world. These were tough, well trained, superbly equipped and disciplined soldiers who collectively constituted the most formidable fighting machine that the Ancient World had ever seen. Nor is this popular view far removed from the truth. The Achievements of the Divine Augustus. It was the first Emperor of the Roman world, Augustus (-AD14) who transformed the politically divisive and somewhat ad hoc military forces of the Republic into a fully professional army with a consistent policy towards the security of the Empire. Equally, it was Augustus who regularised their length of service, appointed all military commanders and organised the campaigns (though seldom in person) which brought them glory, booty and popular acclaim as the conquerors of more territory than at any other time in the history of the Roman state. It need not surprise us that they were devoted to Augustus and his family; indeed, the first Emperor did his job so well that the army remained conspicuously loyal to any Emperor who possessed the Julian name, even 'difficult' ones like Caligula and Nero. Indeed, for most of the first two centuries of Roman rule the army, with the possible exception of the Praetorian guard, seemed to have abandoned its political pretensions, though it was a foolish princeps who did not pay close attention to his soldiers' welfare. Augustus actually inherited some 60 legions after the battle of Actium (31BC ) but soon reduced this to 28 (c.150,000men) in the interests of political security and his bank balance, ensuring that they were carefully distributed throughout the Roman world in accordance with military imperatives and his own political security- too many legions in one place might tempt unscrupulous governors to emulate his rise to power. The main concentrations were on the Rhine (8 legions), the Danube (7 legions) and Syria (4 Legions), though Egypt, Africa and Spain also possessed permanent legionary garrisons. Of course, the Roman army was not simply comprised of citizen heavy infantry - other troops were vital to perform those tasks that disdainful legionaries would not countenance, such as providing cavalry, or firing arrows or scouting and it was again Augustus who created a new professional force, the auxilia (literally 'help troops') out of the irregular units of allies who had helped Rome conquer most of her Empire in Republican times. These auxiliaries also numbered over 150,000 men in total, organised into units 500 or, less frequently, 1,000 strong, and were raised from the non-citizen inhabitants of the provinces and newly conquered lands. With their keen fighting edge and specialised weapons and tactics, they soon became an indispensable part of the Roman army, generally going into battle first, and sometimes showing themselves capable of winning significant victories without involving the legions at all. Although total numbers of legions varied in this period, there were few changes in structure. At this time each legion comprised approximately 5,000 fighting men, all of whom were Roman citizens, organised into 10 Cohorts of c.480 men each. These cohorts were themselves subdivided into centuries which, despite their name, by this period contained only 80 men. The smallest subdivision was the contubernium, the Roman equivalent of a modern section, which consisted of 8 legionaries who shared a tent whilst on campaign and a pair of barrack rooms in their legionary fortress. Each legion also possessed a small number of cavalrymen (about 120) to act a scouts and messengers. This represented the fighting strength of the legion and it is possible that on paper the legions may actually have been 6,000 strong, with the numbers being made up by men on secondment, working at headquarters, providing the governor with intelligence officers or administrative staff or performing other related functions. If these men are taken into consideration, then it is possible that for administrative purposes, the century was composed of 100 men - 80 front line soldiers and 20 who were on permanent or semi-permanent detachment from their parent legion. To make matters more difficult for the historian, at some time during the first century, the tactical utility of the First Cohort was enhanced by increasing it in size to 800 men, arranged as five double centuries. This change is often associated with the Flavians and can be archaeologically attested through the remains of fortress accommodation, but its exact date is unknown. The commander of a legion in our period was invariably a Senator of some standing - a man who had already had a varied military and administrative career, and who had probably reached the rank of praetor at Rome. His official title was legatus legionis because, while theoretically the Emperor held all military power, in practice he delegated it to trusted Senators. Such legionary legates were, on the whole, tough, experienced and highly competent officers, though there were some notable exceptions, and all must, at some time, have served as junior officers or tribuni. These young tribunes were known as tribuni ticlavii -'broad stripe men' ( after the broad purple band found on the Senatorial toga) doing a short stint as part of the Senatorial career structure and acting as staff officers and aides-de-camp to the legate. More useful, however, were the tribuni angusticlavii , the 'narrow stripe men' of Equestrian rank., professional soldiers who had made the army their career and who could be expected to know their business somewhat better. Undoubtedly the most important officers in the legion, however, were the centurions of which there were 60, one to each century, tough, seasoned soldiers who were generally promoted from the ranks and whose quality was assured by the fierce competition which existed, first to enter the centurionate and then to gain promotion through the various centurial grades to the exalted rank of Chief Centurion or Primus Pilus. Centurions were distinguished by their equipment, ( including a vitis or vine staff used to beat recalcitrant legionaries), their more spacious barrack room accommodation, their relatively high levels of pay and their privileges which included taking bribes to exempt soldiers from unpleasant duties. The downside of life as a centurion was that he was expected to lead his men from the front, so presumably casualties in battle must have been disproportionately high amongst this particular rank. N.C.O's within the century included the Signifer who bore the signum or standard of the century, (which was, of course, the embodiment of the honour and spirit of the unit) and who also acted as its banker; the Optio, so called because he had been chosen by the centurion with a view to promotion tothecenturionate himself; and the Tesserarius who was in charge of passing on the watchword.of the day. Other NCO's were to be found at legionary headquarters dealing with the vast amount of paperwork generated by this highly bureaucratic army. The majority of soldiers were, of course, ordinary footslogging milites, although even these had gradations, with soldiers who had earned exemption from unpleasant duties being known as immmunes and those who had served their time gaining the status of veteranus along with appropriate privileges. Auxiliary organisation - non citizen troops. 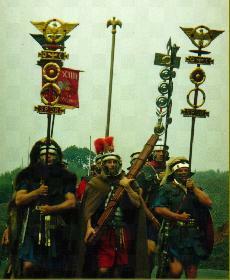 The citizens of Rome provided excellent heavy infantry, but did not easily adapt to other modes of fighting. For this, they relied on non-citizens recruited from the newly won provinces whose national mode of fighting and raw, aggressive edge provided varied and valuable assistance first in conquering, and then in preserving Rome's Empire. Cavalry, slingers, mountain warfare troops, bargemen, archers - Rome relied heavily on all of them. It was Augustus who reorganised the ramshackle allied units of the Republic and gave them regular status, conditions of service, pay and discharge. From his time the auxilia became a permanent and professional part of the military establishment, serving for 25 years and receiving Roman citizenship and a diploma to prove it . Their pay and equipment may have been inferior to those of the legions, but they offered a good career to many a semi-barbarian provincial and the lure of citizenship with is many benefits often proved irresistible. In this way Rome not only gained specialised troops, but also an excellent means of developing Romanitas in the far flung provinces of the Empire. Initially, units were often raised from local tribesmen who were allowed to serve under their tribal leaders, but a number of problems caused by collusion with the local populace in time of crisis meant that from mid-first century they were not permitted to serve in their own areas and were always officered by Romans. To start with, wherever they were serving, numbers were maintained by regular recruitment in their original home areas, though this practice seems generally to have lapsed and been replaced by local recruitment by the mid-second century. Peculiarities of weaponry could, however, persist. Cohortes Peditatae , units of footsoldiers, divided into 6 centuries of 80 men each, also commanded by a praefectus. The legionary cohort is the obvious model. Cohortes Equitatae these are part-mounted units , often regarded as low status, but their flexible combination of 380 infantry and 120 cavalry made them ideal for frontier duties in areas such as Northern Britain. As the first century progressed command of an auxiliary unit was incorporated into the normal career structure of the Equestrian class, with professional soldiers first commanding an auxiliary cohort, transferring to the legions for a few years as a military tribune, commanding an ala and then possibly moving on into civilian administration as a procurator. There are also examples of legionary centurions transferring over to the auxiliaries as away of furthering their careers. One of the problems inherent in the very success of the auxilia as an organ of Romanisation was that as provincials became more civilised, so their warlike qualities became somewhat blunted. and during the second century we find Rome recruiting irregular units from amongst the barbarians across the frontier, the so-called numeri and cunei, literally 'wedges' and 'units', with a view to utilising their warlike qualities against fellow barbarians . This was a policy that would develop considerably as recruitment within the Empire became more difficult.